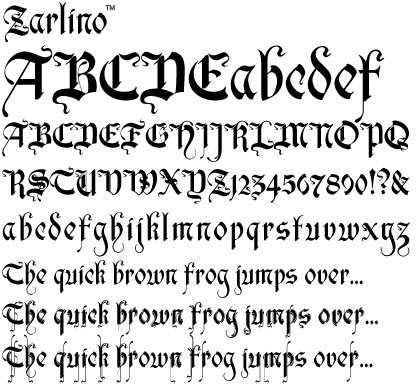 Zarlino is an original typeface in the blackletter style. 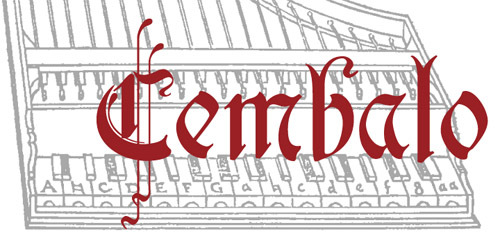 It does not solidly adhere to any of the historical blackletter classifications, but draws from all of them, with some characters owing more to the Roman than the Fraktur. Zarlino Standard is the non-OpenType-aware version. It has two full styles, as well as two embellished alternate fonts that include selected lowercase characters. (The OpenType-aware version, Zarlino Deluxwhich includes three complete sets of upper cases, ranging from the simple to the embellished to the even more embellished, two complete sets of lower cases, and two sets of alternatesis also included in this package.) US$59.